I could drink this soya sauce. It has layers of flavours - not just salty, but also sweet and rich, fragrant and full-bodied, despite it being a light soya sauce. You could call it extra-virgin soya sauce, for it is the first draw from its fermentation process. A friend gave me some to try. It was a revelation, compared with the soya sauces I had tasted over the years. • 1 packet dried seaweed, rehydrated by soaking for a few minutes in water, then squeezed dry. • Before use, leave your tomatoes out in the open for a day or two to deepen their flavour. Then wash and cut them in halves or quarters and place in a bowl. • Top tomatoes with softened seaweed. • Make up dressing with soya sauce, oil, sesame oil and lemon juice. Taste to adjust seasoning. 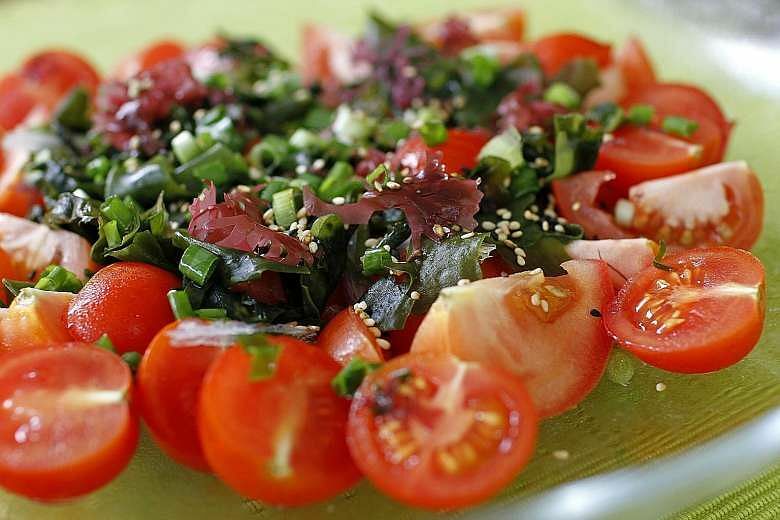 • Pour over tomatoes and seaweed and garnish with chopped spring onion and sesame seeds. Leave for a few minutes for flavours to meld together, then serve. Soya sauce is a larder staple. A Chinese condiment, it is used not only as a seasoning, but also as a dip, such as the ubiquitous soya sauce and cut chilli dip that accompanies Chinese meals. Indeed, it is so important a seasoning in Chinese cooking that almost every recipe calls for it. And its quality can make or break a dish. Soya sauces can be made from the first draw of fermentation to anything from the seventh or eighth draw, where water is added again and again to the original batch of beans. But its quality deteriorates with the number of draws. The kind of fermentation it goes through also makes a difference. In the past, soya sauces were naturally fermented for as long as three to six months in the sun. Today, this process is hastened with chemicals, or chemical fermentation, which takes only a week. The soya sauce I tried was the Yuen Chun triple fermented soya sauce. It is not only the first draw, but has also been naturally fermented three times, each time with a fresh batch of beans. It takes 15 months from fermentation to bottling. There is also a version where bonito powder has been added to it, boosting its flavour further. But you should still be moderate in its use because it is salty, though I feel that soya sauce adds more than just saltiness to a dish, unlike salt. It works very well in a salad dressing, for example, and since this should be the season for salad days, I decided to use it for a simple tomato and seaweed salad. Try to use a selection of tomatoes, whatever colour or shape you can find, including cherry tomatoes which are wonderfully sweet. The variety gives colour and flavour to the bowl. But there is more to tomatoes than just taste. Most importantly, it has lycopene, which is a powerful antioxidant that may help protect cells from damage. Lycopene gives fruit and vegetables a red colour. You can find it in watermelons, pink grapefruits, apricots, pink guavas and, particularly, in tomatoes and tomato products. I also added iron-rich dried seaweed to the tomatoes for an added dimension to the salad's taste and texture. Available at Japanese supermarkets, you can find different seaweed selections in packets, which also include a sachet of dressing. You can simply throw out the sachet, as you can now make your own delicious dressing with this extra-virgin soya sauce. A 210ml bottle of the Yuen Chun soya sauce costs $28, and $30 for the bonito-flavoured version, both available by e-mailing sean.tan@ yuenchun.com, with a minimum order of six bottles. With such flavour, you need just a little to dress not only a salad, but also vegetables or even your saucer of cut chilli.